Six days into the year and we made it to our first movie. Hovering around 0F we had little activity choices other than staying in or going to a movie. We tried taking the dog out and he was happy. It lasted all of 10 minutes. We now had a few more choices of movies than last weekend, so we chose I, Tonya. I'd seen previews, of course, but couldn't quite tell whether or not if it was leaning to be a black comedy. If you're over 30 (40? ), you know the tale. Harding - Gillooly - Kerrigan and the Lillihammer Winter Olympics, and the Nationals before those. Any other bio-pic would have done a telling start to finish of the events. That's not this movie, though it does incorporate most of them in some fashion. If you're looking for Kerrigan, she's barely here. I did find it odd, when she got hit and cried 'why me', a good portion of the audience laughed. For the record, I was not one of them. 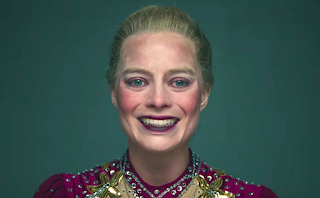 But while you could say I, Tonya was black-ish comedy, I felt at the heart of it, the story was a modern day American tragedy. That is, assuming you believe what is Tonya's truth. There are variations of the truth all over this movie, but there is nothing definitive. Certainly, there are comic moments, and I think there are parts where people laughed a little more nervously at which they were not sure they should. The cast is good. I really don't know anything about Margo Robie. In this movie, if going by her looks, Jamie Pressly (sp?) from My Name is Earl, could have been the stand-in or model for the look. I wasn't 100% sold on Allsion Janney's portrayal of Harding's mom, but she certainly had her good moments. Bobby Cannavale makes an appearance. But he's become the Michael "send me the script, I'll do it!" Caine of his generation. Though I have to say, I think Cannavale makes better choices - even when he is in everything. I'd say some of the dialogue was a little far out there, until you realize that enough it is from interview done by Gillooly, Harding and her "bodyguard" Shawn. I know the film has Oscar buzz and it might get there. I don't know it's worthy of wins. Yeah, I know I wagered on it for tonight's Golden Globes, but I also said, that award show is topsy-turvy and doesn't conform to societal norms. There is no way yet of knowing where this will end up on the list of good for 2018, as the n right now is extremely small. As you'll see below, I scaled back the movie goal to 12. It seems reasonable, but I've been proven wrong before on this..........many a time. Can't recall the story at all but when I see it, suppose I'll be saying "Ah, yes." Anyway, your less than totally enthusiastic thumbs-up confirms that it'd be an omission if it weren't on my list. Thanks. She was a fascinating character. We studied in her psychiatry class as an example of something . I used to follow figure skating and I vividly remember the scandal. Kerrigan was the all-American favorite with her disabled (blind) mom, while Harding was the 'bad girl' of the time since she smoked cigarettes and cursed. While I'm certain I won't be able to convince Spouse to see this with me, I'll likely find it on Prime or Netflix or something later. I will watch it.